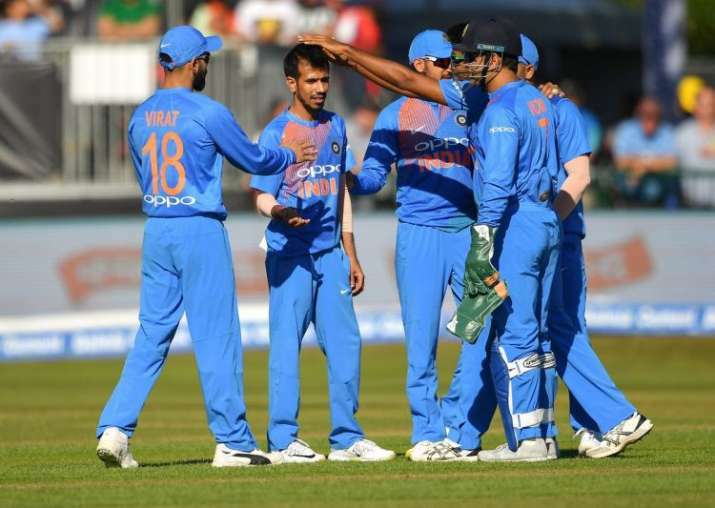 India vs Ireland 1st T20I, Live Cricket Score: Get Ireland vs India 1st T20I Cricket Match Score Live Updates Online and Ball by Ball Commentary from The Village, Dublin at IndiaTV Sports. 23.45 IST: India (208/5) beat Ireland (132/9) by 76 runs to take series lead in Dublin. Kuldeep 4/21, Chahal 3/38, Shannon 60. Peter Chase DROPPED! Does not matter in context of the game but the bowler is hurt. Full and outside off, Chase hits it straight back. Bumrah goes low for the catch but the ball bursts through his hands. He is in discomfort and calls for the physio. Seems to have split the webbing. Meanwhile, that ends the game as well. 23.36 IST: Peter Chase is the last man in. 23.35 IST: OUT! Bumrah removes Dockrell for 9. Lock, stock and barrel. A perfect yorker at the base of off stump. Dockrell backs away and looks to steer it through the off side but misses. Ireland 126/9 in 17.1 overs vs India (208/5) in Dublin. 23.29 IST: Boyd Rankin is in at number 10. 23.28 IST: OUT! Kuldeep Yadav removes Stuart Poynter for 7. Bowled! That is a terrific ball. Kuldeep slows this through the air and Poynter is foxed. He thinks it is a googly but it is a leg spinner. He misses and the ball hits the off stump. Ireland 123/8 in 15.5 overs vs India (208/5) in Dublin. 23.26 IST: SIX! High and handsome! Tossed up outside off, the googly, Dockrell gets underneath this one and sends it sailing over long off! 23.25 IST: Into the bowlers now. George Dockrell is the first of them to bat. 23.24 IST: OUT! Kuldeep Yadav removes Thompson for 12. And as always, Suds jinxes and there is no spell as a counter-jinx. What a cruel follow. He just observed that the two Stuarts were getting a little partnership and boy, it has been broken. On middle, Thompson comes down the track and swings it towards long on. But cannot clear Hardik Pandya over there. Ireland 114/7 in 15.1 overs vs India (208/5) in Dublin. 23.11 IST: Stuart Thompson is the new man in at number 7 to join the procession. 23.06 IST: Kevin O'Brien walks in at number 6, replacing Shannon. 23.05 IST: OUT! Kuldeep Yadav removes Shannon for 60. Finally an LBW shout has met with a positive response. This looked way too dead to be ruled out alive. Kuldeep keeps this very straight and Shannon attempts a cute paddle. He misses and is hit right in front of the sticks. Up goes the umpire's finger on the appeal. Very well played, James. Albeit he was dropped twice... Ireland 85/4 in 11.3 overs vs India (208/5) in Dublin. 22.59 IST: Captain Gary Wilson walks in now. 22.58 IST: OUT! Kuldeep Yadav removes Simi Singh for 7. Easy peasy. Simil never looked comfortable against spin and has eventually been relieved of his misery. Full on middle, Singh looks to flick but is beaten by the lack of pace and the turn on that. Gets a leading edge which goes straight to Virat Kohli at short extra cover. Ireland 72/3 in 9.3 overs vs India (208/5) in Dublin. 22.54 IST: FIFTY! James Shannon hits his maiden half-century off 29 balls. Yuzvendra Chahal to James Shannon, 2 runs. MAIDEN T20I FIFTY for Shannon! In just 29 balls. Not a bad speed. Full and on middle, James just works it through mid-wicket and gets across for the single. Then takes the second as well. Ireland 72/2 in 8.5 overs vs India (208/5) in Dublin. 22.52 IST: SIX! STUPENDOUS! Full and outside off, Shannon gets down and mows it over mid-wicket for a biggie! IRE 70/2 in 8.4 overs. 22.48 IST: Hardik Pandya is back on. 22.47 IST: Shannon scores another SIX! Full and outside off, slogged towards deep mid-wicket for a run. 22.45 IST: Simi Singh walks in at number 4, replacing Balbirnie. 22.44 IST: OUT! Chahal removes Andy Balbirnie for 11. Oh Dhoni could have waited till India's next match and then whipped off the bails - he had so much time. Flighted smartly outside off, Balbirnie takes off for a stroll in the park but in the next second, is sent out of the park. He misses his swipe and his attendance is not recorded for the shot. Dhoni collects and whips off the bails with ages of time. Ireland 45/2 in 6.3 overs vs India (208/5) in Dublin. 22.42 IST: Spin time. Yuzvendra Chahal into the attack. 22.36 IST: Change of ends for Bhuvneshwar Kumar. 22. 22 IST: DROPPED! Chahal is smiling. Kohli will not be. A length ball on middle, Shannon looks to flick but gets a massive leading edge. It should have been taken by normal fielding standards but Yuzvendra Chahal loses it in the sky and is late to react. Ends up diving away from the ball. Two runs taken. 22.02 IST: India post 208/5 in 20 overs against Ireland in Dublin. Rohit 97, Dhawan 74, Chase 4/35. SIX! What a way to end the innings! Tremendous wristwork from Hardik Pandya. The ball is pretty full, on middle and Pandya does a Dhoni - brings out the helicopter shot and swings it cleanly down the ground for a biggie! Just 7 runs and 3 wickets from that final over - INDIA FINISH ON 208/5! 22.00 IST: Manish Pandey is the last man in... well, assuming that this will be the last ball of the innings. 21.59 IST: OUT! Chase removes Kohli for 0. Third wicket in the over! Bizarre final over. A length ball outside off, Kohli brings out his best ever flick shot perhaps - but finds deep mid-wicket to perfection! And guess who is the fielder? Who? Who? I shall leave that for the scorecard to display. A duck for the Indian skipper! India 202/5 in 19.5 overs vs Ireland in Dublin. 21.58 IST: Rohit Sharma OUT! Colin Munro's record stays intact. Rohit would have become just the second man, after Munro, to score three centuries in T20Is. A slower ball becomes the undoing of Sharma. Is early into his pull and he misses the ball and it hits the leg stump. That is sad. So near... yet so far. Was within a hit of creating the record but just missed it by a whisker. End of a wonderful innings though. 21.52 IST: FOUR! Gets off the mark in style! A short ball on middle, Dhoni pulls it behind square leg and gets a boundary! 21.48 IST: OUT! Chase removes Raina for 10. A wicket out of nowhere. Chase bowls it short, around middle, Raina looks to tuck it away but plays is rather uncomfortably. Hits it uppishly and Kevin O'Brien accepts the dolly at deep square leg. India 186/2 in 17.5 overs vs Ireland in Dublin. 21.45 IST: SIX! Stand and deliver. Chase misses the yorker, bowls a low full toss and Rohit just hits probably the best shot of the day - lofting it straight back down the ground for a biggie. 21.39 IST: Suresh Raina walks in at number 3, replacing Dhawan. 21.38 IST: OUT! Kevin O Brien removes Dhawan for 74. Stop the press. Ireland have taken a catch. Stop the press after starting it again. STUART THOMPSON has taken a catch. Full and outside off, Dhawan looks to go over the top but mistimes it. The ball goes towards long off and Irish fans might have just closed their eyes on seeing who is underneath it. But this time, Mr. Thompson comes running in and takes a fine diving catch. He then signals towards the crowd in jubilation as to finally having taken one. End of a mammoth opening stand. India are in a terrific position - this is my opinion - there are a few besides me that they are going below par! Such are the standards set by this team. Dhawan well, might consider a century gone abegging. India 160/1 in 16 overs vs Ireland in Dublin. 21.36 IST: FOUR! When you are attending a buffet, you can eat what you want. Only your mother, wife or stomach may not agree though. Your tongue will certainly not mind one bit. Ireland are turning out to be that tongue for India. A high full toss, wide outside off, Sharma flays that hard and gets a top edge. But it sails over the man at short third man into the fence behind. 21.33 IST: SIX! Pay the price now, Ireland. Full and outside off, Rohit gets down and mows it miles over mid-wicket! 21.29 IST: SIX! SLAP! Dhawan welcomes Dockrell back in style. Jumps down the track and absolutely cobbers it over mid-wicket. 21.21 IST: SIX! SLAM! Someone shouted 'CATCHHHH!' but to whom? That has gone way into the stands. A length ball outside off, Rohit gets down and dumps it somewhere outside the ground near the mid-wicket region. 21.19 IST: FIFTY! Rohit Sharma hits his 15th T20I half-century off 39 balls. Kevin O'Brien to Rohit Sharma, 1 run. SAFE! And a half century for Rohit. His third in succession in T20Is. A bit of a drama though. Full and outside off, Rohit drives it through the covers where the fielder fields and throws it at the stumps at the bowler's end. It is actually a pretty simple single but Rohit collides with the bowler and is in a bit of a strife as the bat is plonked in, instead of being dragged in. However, after being referred upstairs, replays confirm that Rohit is fine. 15th T20I Fifty for Mr. Consistent. India 112/0 in 12.1 overs vs Ireland in Dublin. 21.11 IST: FIFTY! Shikhar Dhawan hits his 7th T20I half-century off 27 balls. SIX! Dhawan wins the race! In the previous over, it did seem like Rohit might get there first but Dhawan has managed to take his Ferrari past the line first. Jumps down the track, gets to the pitch of the ball and flicks it high in the air, getting it over mid-wicket. 7th half century in this format. 100 UP FOR INDIA AS WELL. A double certainly on the cards. India 100/0 in 10.1 overs vs Ireland in Dublin. 21.08 IST: SIX! Into the crowd! The fifth biggie of the innings. A length ball, following the batsman down the leg side, Rohit just steps away from the stumps and lofts it way over mid off for a biggie! Moves to 44 from 33 balls, threatenbing to reach the 50-mark before Dhawan. 21.05 IST: FOUR! What a way to conclude an over! Spoils a good over. Short and wide outside off, Dhawan stays leg side and flays it through the off side - behind point for a boundary. Moves to 42 from 24 balls with his third four. IND 84/0 in 9 overs. 21.00 IST: HUMONGOUS! SIX! He has picked the biggest boundary on the ground, has Rohit. Jumps down the track and whips it miles over mid-wicket. The stand is now worth 74 from 46 balls. Rohit has moved on to 34 from 26 balls. 20.55 IST: SIX! And what a footwork there! Dhawan on fire! IND 59/0 in 6 overs. What a way to bring up 1000 T20I RUNS AS A PAIR and also end the Powerplay. Full and on middle, Dhawan comes down the track and lofts it way over the sightscreen. INDIA END THE POWERPLAY AT 59/0. 20.53 IST: Shikhar Dhawan DROPPED! First opportunity for the Irish. Shikhar is early into his flick and the ball is pretty wide too, outside off. Takes the leading edge and is skied into the air. Three fielders run after it - Short third man, point and cover - the man from point, Simi Singh, almost gets to it but then stops at the last moment, perhaps sensing that he has company either side and that costs him. The ball lands JUST out of his reach. Two runs taken. 20.50 IST: FOUR! Short and outside off, Sharma cuts it hard through point and finds the boundary. Ireland bowling way too many bad balls here. 20.48 IST: SIX! Effortless. A length ball outside off, Dhawan lofts it, again without much fuss and gets it over mid off. 20.45 IST: FOUR! Not cleanly timed but it will do for India. A length ball wide outside off, Rohit eases it over cover. Does not hit it from the middle of the bat but gets it over the top. 20.43 IST: FOUR! Oh dear... that is literally saying - NO MERCY. Dhawan walks across his stumps well in advance and on seeing that, the bowler bowls it well outside leg. Could have been left alone but Dhawan just pulls it past short fine leg for a boundary. IND 28/0 in 3 overs. 20.42 IST: SIX! Here comes the first six of the match and Dhawan is the batsman. The six has come from the blade of the man who recently scored a century in a session in a Test against Afghanistan. It is a length ball on middle and leg and Dhawan nonchalantly hammers it over mid-wicket. 20.40 IST: FOUR! PUMMELED! That one look is enough for Dhawan. He just jumps out of the crease and lofts this length ball over mid off. The ball bounces just inside the fence. 20.37 IST: EDGED! BUT RUNS! Rohit gets some bonus runs here. A bit fortuitous, one can say. Rohit looks to drive but the ball comes in a bit and goes off the inner half of the bat past short fine leg. 20.36 IST: FOUR! BYES! First boundary of the game. Poor ball, way down the leg side, Rohit's pads do a favour on the bowler and keeper by coming in the way. The ball deflects past the diving keeper and races to the fine leg fence. IND 7/0 in 1.3 overs. 20.33 IST: Just one run from the over. Boyd Rankin to Shikhar Dhawan no run. Back of a length around off, angling away, now SD wants to tap and run but Rohit sends him back. A decent start from Rankin. IND 1/0 in 1 over. 20.30 IST: Out come the Indian openers - Shikhar Dhawan and Rohit Sharma - to a huge roar from the crowd. Does not matter where the Indian team goes - the support is always pretty big for them. The lanky Boyd Rankin will start off proceedings to Rohit Sharma. Time for the action to commence. 20.25 IST: The two captains pose with the silverware ahead of the two-match T20I series. 20.12 IST: "Looking at the wicket, I think it is going to play really well. It is going to come onto the bat nicely. We practised in London for a day and we practised here yesterday. We have played the format enough, we played IPL for two months, so we don't need to practise much as we are used to it. Weather is something that we took time in getting used to. The wind is very cool so it a good change from heat back home. My neck is absolute fine, I was 70% a month ago but now I am fit and fine," says Virat Kohli at the toss. 20.06 IST: "We are going to have a bowl. This looks like a good wicket. It is a very hard ground to defend so that played a big part in decision in bowling first. We know India chase very well and that was a part in taking the decision too. Preparation have been good, we had four games in Holland and a game against Sussex. We know we need to improve in this format. We are looking forward to upset India. We have no William Porterfield and Andy McBrine in the playing 11," Ireland captain Gary Wilson says after winning the toss. 20.01 IST: Toss! 1st T20I: Ireland win toss, opt to bowl against India in Dublin. 19.55 IST: Ireland skipper Gary Wilson is gearing up for the clash. Will he want to bat first or bowl today? 19.50 IST: The crowd in Dublin is all charged up for the first T20I. 19.40 IST: Take a look at the pitch for the first T20I against Ireland. 19.10 IST: Here are the complete squads of India and Ireland for the two-match T20I series. Brief preview: Virat Kohli will return to action after recovering from a neck injury when India take on Ireland in a two-match T20I series, starting July 27. The T20I rubber in English summer will be a rehearsal for the Indian cricket team ahead of tough England series, which includes three ODIs, three T20Is and five Test matches. Skipper Virat Kohli and the in-form KL Rahul batted together in adjacent nets against spin and pace respectively. While Rahul has been a constant part of the T20I squad, Ajinkya Rahane's omission from the ODI squad means that he is once again a contender for the number four spot when the three-match series against England begins on July 12.